One on One With Eddie Lack! | Not Your Average Hockey Blog. One on One With Eddie Lack! Without further to do. Here it is! We are in bold. First off, how has your day been? My day has been good thank you. Lots of rehab right now so it’s kind of challenging but it feels good to see the progress. Many of our readers are just casual hockey fans and might not know who you are. So who are you? Maybe a cool fact or something? 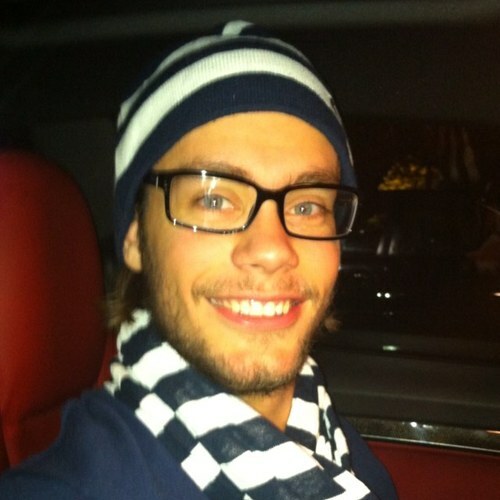 My name is Eddie Lack and play for Chicago Wolves in the AHL. Off the ice I love to cook and play Xbox. Your pads are really cool. So when you get called up to an NHL team, will your pads change or are you pads Wolves for life? I got several different ones so if i get called up im ready for that! I’m hybrid even though i’m still trying to react to shots instead of just drop down and hope for the best. What was cooler? Playing in the 2011 Calder Playoffs or being a reserve for the Canucks playoff run? Those two are so different so you can’t compare them. I enjoyed playing for the Moose very much that year and that game seven is still haunting me haha. Being in Vancouver was just nuts. Fans there are great and loved every minute of the playoff up there. What’s the difference between playing in Sweden and playing in North America? You’re one of the first guys I’ve interviewed who’s made it to the NHL not by playing in the NCAA or CHL, but through Europe. Do you have any special skills that you don’t think the North American bred guys don’t have? I don’t know. The goalie game is kind of the same wherever you come from. The biggest adjustment for me was playing the puck. That’s way harder over here. What has been your highest part of your career so far? Getting called up for the first time for sure. Even though I only sat on the bench, it was really cool. Something I worked for my whole life. That’s right now being hurt. The following are some “weird” questions. It interests even the readers who aren’t big fans of hockey. It also gives you some things to remember about our interview years from now. Goalies are usually part of two groups. Weird and crazy in the locker room (Ilya Bryzgalov) or the calm, cool guy in the room reading a book (Martin Brodeur). Where are you? I think I got both sides. Definitely the weird and crazy guy in the locker room but I have a serious side outside of the rink when I have too. Lots of Kanye West right now. Who has the worst taste in music in the locker room? You love to cook, what’s the best dish you make? My favorite is Chilean seabass. Very tasteful fish, you cant go wrong with it. When you were young, what was your worst subject? Music, I love music but i’m not very talented at it. Every hockey team does pranks, whats the best you’ve seen/done? Haha don’t know if I can go in to the best ones here. If you could have one superpower, what could it be? Anyone you suggest me to do an interview with? In my team I would go with Darren Haydar! Any advice for aspiring goalies? Just have fun, that’s what its all about!